When my gran first told me about Bridge I didn’t realise it would be so much fun. Now I am in the school Bridge club and I love it. Learning Bridge has been fantastic , I hope other schools in our area will take it up and there can be more competitions. All our coaches, particularly Mona and Bill Thomson have been great at giving us tips and support. 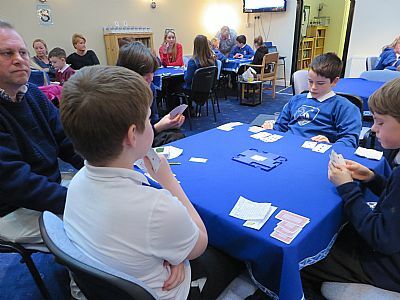 I really enjoyed learning how to play Bridge, we have progressed so well with Mona and Bill’s teaching that we actually went to a competition in Glasgow and came 7th out of 21. I really hope I can take this further after I leave St Andrews Primary school. If there are more competitions, we are ready to go for it and do our club proud as super Bridge players. I’ve really enjoyed the opportunity to go to Glasgow and hope to be there again next year as a P7!